beNews is an ad optimized WordPress theme with multiple ad slots and option to detect adblockers. To make money out of your blog or your online magazine, beNews is your perfect choice. Its modern responsive design is suitable for any kind of blog or magazine. With tons of customization options and various predefined designs, it is possible to create your own unique website. It is fast loading and coded with best coding practices. It offers many ad slots for displaying your ads almost anywhere on webpage for best conversion rate. It is also possible to enable the built in adblock detector to hide content from users who are using ad blockers in their browsers. 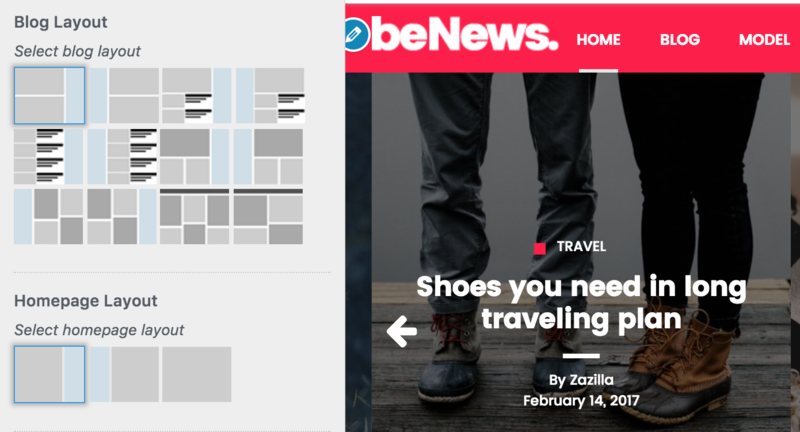 beNews offers two ways to build your own custom magazine layout. One using widgets and other using drag and drop page builder. Use any method that you prefer. When you are in hurry or you lack customization skills, you can use its 1 click demo importer to quickly make it look like the demo. Currently it comes with 3 predefined demos and we are adding few more demos. Control each and every option of your theme with live customizer and see the changes as they are happening. Saving your time to save the options and then refresh the page each time you make any changes to options. With 1 click demo importer, get your website up and running in no time. Choose any of the predefined demos and with just one click, all of the text, images, widgets, post and pages will be imported automatically. With the integration of drag and drop page builder with beNews, it becomes easy and smooth experience to build magazine layouts with no coding knowledge. We have added 12 unique blog layouts to beNews. These layouts are not only available for blog pages but category, author, tag, search results, archives all pages can have different layouts. We have added few different ad locations to beNews and each location can show Google Adsense, banner ad or any other type of ad with ease. With beNews, you can hide content for users who have enabled ad blockers in their browsers and show content only to those who can see the ads. 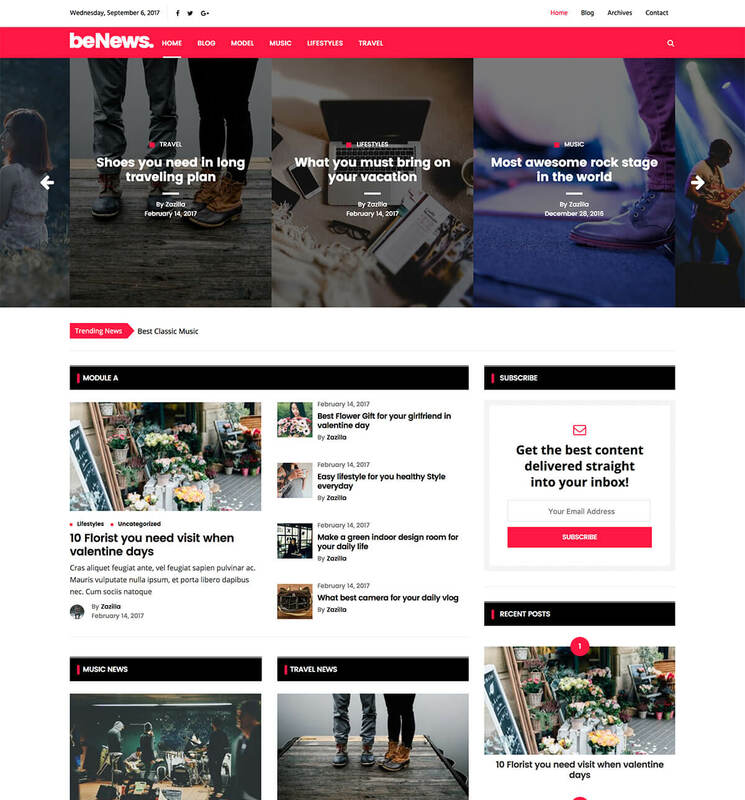 beNews WordPress theme is full responsive from header to footer and it works best on all kind of devices from large desktops to mobile phones. Breaking news ticker allows you to select and highlight important posts of your blog or website on the homepage. We regularly update our themes and whenever there is an update, you will be able to update the theme with just 1 click. beNews comes with premium support and whenever you are in trouble, your issues will be resolved in no time. beNews is 100% translation ready theme and supports RTL layout. You can translate it to any language of your choice and it will work perfectly. Still not satisfied? Here are few more exciting features to make your mind.